The Navy counselor rating is not open to the incoming recruit. This rating requires a thorough knowledge of the Navy organization, including personnel and administrative procedures and policies which takes time to thoroughly understand. The NC rating accepts only petty officers first and second class who have been in the Navy for several years before attending the secondary rating school. A Navy person who intends to apply for this rating must have experienced the total environment of the Navy. The individual's background must clearly indicate familiarity with shipboard life; first-hand knowledge of varied aspects of Navy life and duties gained through participation in a wide range of activities and ​assignment,; and a high level of leadership as well as comprehension of diverse assigned duties. It is not uncommon for Career Counselors to have experienced Fleet life onboard a ship or submarine, at an air squadron, and even in the Special Operations world. Having a wide experience of tours or working with different communities will be helpful in advancing in this career field. Navy counselors offer career guidance to Navy people aboard ships and at shore facilities, and to civilians who are considering enlistment in the Navy as recruiters. They assist commands in organizing and implementing an aggressive enlisted career information program; evaluates enlisted career information program within own command and/or subordinate commands as applicable; supervises and coordinates interviewing and counseling efforts; counsels individuals and gives presentations to civic groups, naval personnel and their family members on the advantages of career opportunities and professional development in the Navy; establishes and maintains liaison with local media; serves as Transition Assistance Program Managers; provide counseling on veteran benefits and relocation programs. Career Counselors not only help sailors navigate the tour options within their rating for advancement, educational opportunities, but only transferring into other communities within the Navy as well. The NC - Navy Career Counselor become a sailor's Command Career Counselor (CCC) and is tasked by the Commanding Officer and the Navy Personnel Command (NPC) to manage the enlisted career retention and career development program within the command. This important position requires great trust. In fact, the CCC reports directly to the Executive Officer via the Command Master Chief, Chief of the Boat, or Senior Enlisted Leader. recruit civilian personnel into the Navy. Counseling duties are usually performed in an office environment. NCs work closely with others, but sometimes work independently with little supervision. Most of their work is administrative, not physically demanding, but constantly learning to understand new advancement programs and opportunities available to the sailors in their command. Program development training is available in this rating during later stages of career development. "C" Technical School San Diego or Norfolk, Va. last four weeks and focuses on understanding the processes of advancement, personnel options available (*which constantly change), personnel and office administration, Navy rights and benefits, methods and dynamics of counseling, Group and individualized instruction, and conferences / career fairs. NCs wishing to become Navy recruiters attend a specialized 5-week course in Pensacola, FL. Other schools available to the Career Counselor are the following: Recruiter in Charge (2 weeks), Zone Supervisor (3 weeks),and Chief Recruiter School (2 weeks) all in Pensacola, FL. Candidates for the Navy counselor rating are selected from petty officers first class, and petty officers second class eligible for advancement to first class. Note: Advancement ( promotion ) opportunity and career progression are directly linked to a rating's manning level (i.e., personnel in undermanned ratings have greater promotion opportunity than those in overmanned ratings). 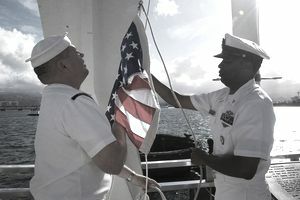 Like many sailors careers, advancement depends upon the needs of the Navy and the manning levels of the rating of the sailor. The NC is no different, but is trained to explain the process and help others move through each level of the Navy as the sailor desires. Navy Career Counselors transition to the NC rating after completing at least one sea tour in their initial rating. After transition, the length of the first sea tour will be determined on a case-by-case basis depending upon the individual's sea tour experience. Career Recruiters have no sea duty billets.